A few weeks ago I was at a conference in Portsmouth, United Kingdom, assessing the historical, contemporary, and future relationship between the Royal Navy and the nation. Amongst the discussions that took place was one chaired by the former First Sea Lord concerning the issue of construction and procurement, in particular the ability of Britain’s shipbuilding industry to meet the requirements of the RN and at what cost. The UK still produces some of the most technologically sophisticated warships and weapons systems in the world, as the Type-45 destroyers are testament to. Yet, they increasingly come at a premium at odds with the current weak state of the country’s economy and an austere government that has instigated huge cuts to its armed forces, particularly its navy, following 2010’s Strategic Defence and Security Review (SDSR). The rationalisation of Britain’s defence industry from decades of mergers and takeovers and the rise of monopolistic monoliths like BAE Systems do not help, with a lack of domestic competition for national defence contracts that might otherwise lower prices. Still, a major issue lies in the decreasing numbers and frequency of warship orders, and the higher cost per unit this inevitably produces. 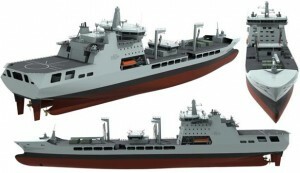 We’ve already seen Britain outsourcing certain shipbuilding capabilities, with four new Royal Fleet Auxiliary tankers ordered from South Korea in February of this year, and it now seems unlikely that another tanker will be produced in the UK again for the RFA, at least in the short to medium-term future, as those skills are lost from its workforce. The question is where Britain draws the line. Does the UK and RN need to make a firm decision as to what industrial capacity it should safeguard in its national strategic interest, such as nuclear submarine construction, and what could be procured from overseas without loosing too much operational capability? Smaller patrol craft and minesweepers perhaps? To do so could produce a more affordable, sustainable navy, and abate the continuous reduction in numbers. As a historian who studies the post-Second World War development of colonial naval forces into sovereign Commonwealth navies, this issue to me highlights a fascinating shift in strategic-economic relations that raises questions and concerns in areas of geopolitical uncertainty. For several decades, the vast majority of the world’s arms, particularly more technologically-sophisticated warships, came from the same small group of producers located in the traditional ‘First World’. The underdeveloped industries of post-colonial countries, a hangover from imperial policies to turn colonial economies into primarily suppliers of raw materials for the metropole’s industry, meant that they were often continuingly dependent on the former ‘imperial motherland’ to supply them with equipment for their nascent armed forces, subsidised by development aid packages. This was particularly the case in countries that didn’t wish to align themselves in the bi-polar international system of the Cold War, such as initially India. Countries like Britain derived not only economic benefits from such a relationship, including offloading its outdated and surplus warships, but political and strategic ones too from being able to shape the composition and capabilities of such beneficiaries to complement its own designs for ‘Commonwealth Defence’. India recognised the undesirableness of such a situation, and has made a concerted effort to overhaul its shipbuilding industry over the last fifty years, embarking upon ambitious indigenous construction programmes, including recently Shivalik-class stealth frigates and Vikrant-class aircraft carriers. Other formerly ‘developing’ countries, most notably China, also now have impressive manufacturing capabilities. With that comes opportunities for export, and as the industrial capacity of established producers in the West declines and is surpassed by the more-competitive emerging economies of the East, new defence agreements will be forged between untraditional partners. The link between economic and politico-strategic influence is intrinsic, and as countries such as Britain were once able to use naval procurement as leverage and a way of furthering their own interests, new producers such as China and India can be expected to do the same. This could lead to the creation of new strategic alliances and increased uncertainty in regions of escalating maritime tension and instability, with potentially frightening consequences for all. Dr Daniel Owen Spence is Lecturer in Imperial and International History at Sheffield Hallam University, United Kingdom, and publishes research on nineteenth and twentieth century naval history.